So I got this pattern from Love of Quilting and I checked the pattern and I checked fabric and stitching and its just not lining up! I feel like I'm going crazy. The final squares should be 3.5 but by triangle ones are 3.75 should I cut the larger triangle down? or cut the sides of the the other? I have no clue how to fix. Its creating major puckering issues. I believe that your block on the right....the center row, the outside triangles (lightest color - there are 2) don't come to a point, thus giving you extra length on this block. 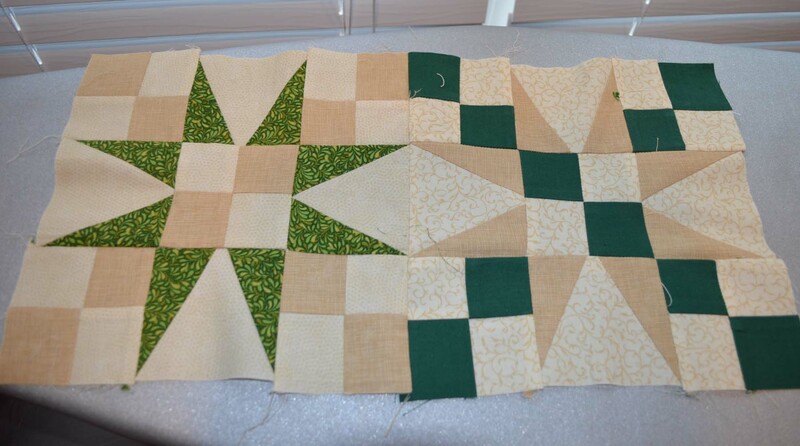 ok after you sew your blocks together each individual one before you sew them to the next one are you squaring them up? this is your issue I think. Square each block up, after you sew them together so they make the right size for the block your doing in the end ie four patch across down is 3.5 each square. the three across is 4.5 and sew on. even with my stupid quarter inch foot I still have a bit of trimming to make those blocks square no idea why either thought it would solve all my troubles ..
glad you have found the right pattern did you tell the people that there is an error or check to see online if there was a published fixed pattern often they do that put the correct measurements up as a sorry here are the ....online for you to use. frustrating to say the least. pretty pattern however. Hope it all works out for you. It is amazing how easily it is to get a "whomp". Practice helps - none of my first stars were what I really hoped they would be. As I did them I learned methods that worked for me. So when I click on your image - it gets blown up. What I see is that the problems are not consistent. By that I mean, one of the valleys of the star points is dead spot on (another two are very close) while the others are off. Also the four patches on the top center are pretty close while the set at the bottom are not and the final sizes are not the same either. What is the final size of these blocks? I hope I have your question correct. When I do this type of block, I measure each subset. In doing that, I also measure , in the case of the 4patch. if the center seam is actually in the center. On the point of the stars, I measure the entire rectangle and also check for the 1/4" seams at the spot where the sides form the V.
When I assemble the Star Points to the center, I put a pin vertically through the bottom of the V and then through its corresponding seam on the 4 patch where I want it to match. I then place pins on either side- removing the vertical pin afterwards. I use that method sometimes when I sew 4patches to one another as well. Whn done I also, measure the final blocks, measuring the overall size and the location of the the two vertical seams and horizontal seams to one another and make sure they are where they are supposed to be. What is a flat edge pattern? I think the triangle-in-a-square unit is tricky to assemble properly. Something that helped me a lot was to draw the seam lines on the triangles and pin at the seam intersections. The edges/ears/tails are not even. I am using my nook right now , so can not refer to anything. I don't know what "flat edge" is, either. But I agree, it's always wise to make up one block of a pattern before cutting all your fabrics. Sometimes I make that test block up in fabrics I really don't care for, just as a test of the pattern. Good luck to you! If you are interested, Sally Collins wrote a great book on machine piecing accuracy. Her cutting and sewing tips have helped me immensely. I have bought that book as a gift for several quilty friends. also you might put a skinny sashing strip in between the blocks. that would help in not having to match the blocks together. Good luck. Something is off with your piecing. There are too many points cut off and no 1/4" seam allowance on many of the outside points. There must have been a post removed for the flat edge and tri recs info. That is what I tried to do too...and the squares started coming out 3.25 instead of 3.5. That is why I think its the template. Believe it or not I measured all the 4 patch and they are 3.5. ugh! I think its the A and B triangles. Now I just have to wait for my tri recs. This is so frustrating! you should download the pp pattern that is for the points. I have a site on my computer that I use for them. makes a world of difference. I will look it up for you. I have used this block in about 5 different quilts and it always makes them really pop. UGH! I figured it out! You can't align them to each other, which is what I was doing then it was making it short. That is - in my opinion - a relatively tricky unit to get to come out close to right! I was ironing it like crazy, ha ha which caused more issues! What is the best way to press? Some people do say open, and some say to the darker fabric. I do that with the 4 blocks so the seams match nicely. I will not speculate since I don't know what the size is of each piece.. However on looking at the block I would think the problem is either in the cutting and piecing. If cut correctly then in piecing. It looks like the seams are inconsistent. When sewing different heaped together I have found the scant quarter seam is necessary for the triangles to match the squars. That was smart to check online. I have had enough problems with Love of Quilting patterns that I no longer buy any of their products, because I don't want to deal with the difficulties. That's just my experience and I'm sure others love their patterns. If you look closely at the triangle tips, there is inconsistency in the sizing which may call for re-piecing....who knows why some of these things don't work? It's just the nature of the beast!